The Campsite features a magnificent water park with 4 slides, a water games area and large, heated pool and paddling pool. Hilarity, thrills and spills at the campsite! Each of the 4 slides is fitted with a landing area to ensure your children have fun in all safety (please respect the safety distance at the top of the slide). 3 straight water slides and one looping slide… perfect for some exciting races! Fancy some water games? The water games area is ideal for all the family. The water park is accessible to reduced-mobility guests too, as is the rest of our beautiful campsite in the South of France, Provence-Mediterranean. Our spacious pool is heated right from the start of the season. Jump in! Bathing with all the family. Located near, but slightly away from the pool, the paddling pool is a real treat for kids! The enchanted fountain is designed to familiarize young children with the joys of water. The paddling pool is heated, so your little ones can makes the most of it throughout the season. Relax and unwind on one of the many sun loungers set around the pool and paddling pool as you revel in the sunshine and pleasures of your camping holiday in the South of France, Provence-Mediterranean. You will also find sun loungers placed in the sunshine and shade near the water park games area and slides, where you can tan, read, or simply lie back and enjoy the view over the magnificent trees and flowering plants all around you. 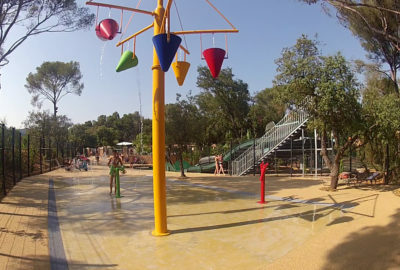 Welcome to the South of France, Provence-Mediterranean – and the only campsite in La Londe-les-Maures and Hyères boasting a water park with games and slides!